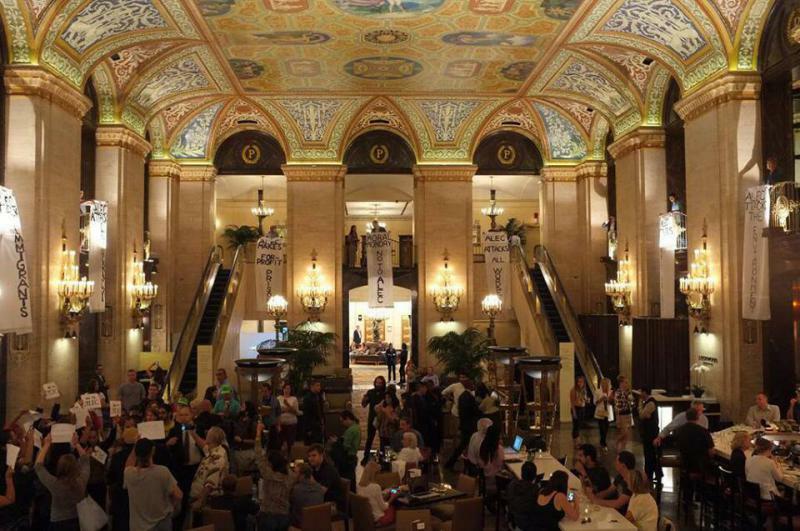 As corporate lobbyists and legislators were arriving, the Illinois Moral Monday Coalition made good use of the stunning background of the Palmer House lobby to drop simultaneously several anti-ALEC banners from the balconies. Six of the dozens of participants were arrested for their acts of civil disobedience in speaking out about ALEC. Fox Valley Citizens for Peace & Justice will rally in opposition to a US military strike against Syria on Thursday, September 12th from 4:30 PM till 5:30 PM in front of the new Walmart at 1100 S. Randall Road in Elgin. That’s a block South of Bowes Road on the West side of Randall. We chose that site for maximum visibility and that time for the maximum flow of traffic along Randall. Fox Valley Citizens for Peace and Justice shared a live video. Saturday afternoon's presentation by David Stocker and Mike Barr at the Gail Borden Library. Fox Valley Citizens for Peace and Justice shared a post. In a conference call this afternoon, Rep. Pramila Jayapal confirmed two important parts of the bill. Hospitals will not be reimbursed on a fee basis but will be paid "to be a hospital, just like a public library." (This doesn't quite say they will have to be non-profit or government-owned.) Also, Medicare will have a right to negotiate drug prices. GO HERE to subscribe to our discussion list. Butterflies Are Free: Trauma, Turmoil, and Testimony at the US, Mexico Border– Public Program, March 30th, 2019, Elgin. We have fought for several issues during this busy 2018 summer. Enter your email to receive news on events and more from FVC4PNJ. We Will not share your email address. (c) 2016 - ALL RIGHTS RESERVED Some content may be previously copyrighted and is used by permission. Notify us if you discover content that has been used without permission.